Becoming a sales manager and leader is much like running a marathon, establishing a foundation with comprehensive training and then running the course over time for success and to achieve your personal objectives. 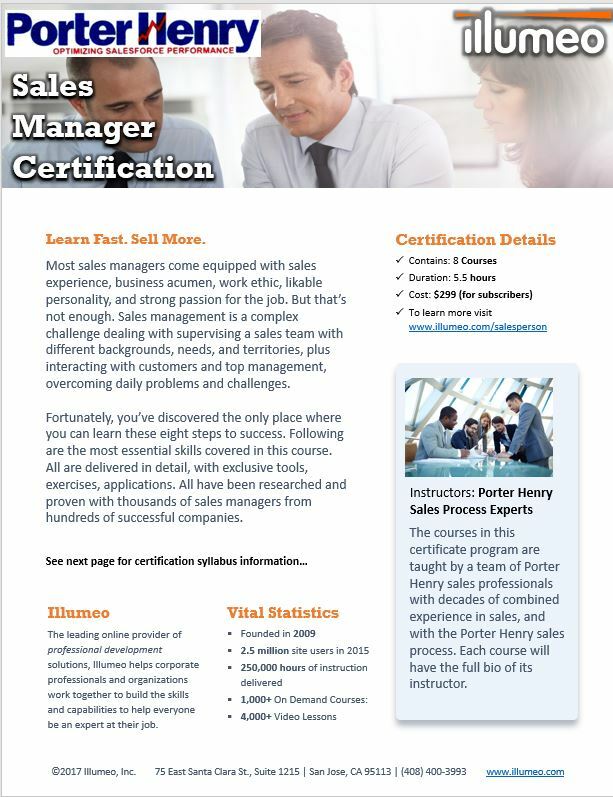 This certification course provides a unique learning foundation covering the eight steps that the ultimate sales manager must acquire, along with all the unique learning and tools you need to find success. Most sales managers come equipped with sales experience, business acumen, work ethic, likable personality, and strong passion for the job. But that’s not enough. Sales management is a complex challenge dealing with supervising a sales team with different backgrounds, needs, and territories, plus interacting with customers and top management, overcoming daily problems and challenges. Fortunately, you’ve discovered the only place where you can learn these eight steps to success. Following are the most essential skills covered in this course. All are delivered in detail, with exclusive tools, exercises, applications. All have been researched and proven with thousands of sales managers from hundreds of successful companies. This course defines Sales Coaching and explains the benefits of coaching. This course enhances sales coaching for results and creates a joint process to improve individual sales and sustain performance. This course shows that when coaching fails to improve performance, attitude, behavior, and motivation, it’s time for counseling. This course covers how to recognize performance warning signs and symptoms, before they become problems. This course focuses on eliminating time-killers like interruptions, inefficiency, avoiding low-level activities that someone else can handle. This course covers an essential but challenging skill: finding and retaining top salespeople. This course helps generate “followers” that every leader needs and, most importantly, create sales results. This course discusses the most critical behaviors that a professional sales manager needs to develop, so he or she can build trust as a leader.